Alongside the market for alarm and video technology, fire protection forms a significant market with a very large sales potential. In existing solutions, the alarm normally notifies a central unit, which then uses LED lights to indicate which sensor has been triggered. This does not however allow any quick orientation and planning of a possible evacuation of the building. With our new Alarmtab security system, we are now able to solve this problem. 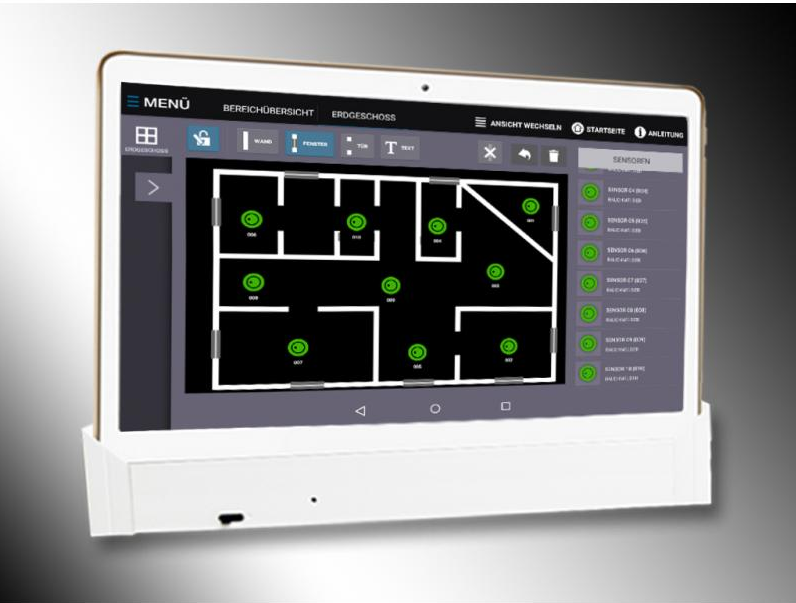 The user can easily re-create the floor plan of the building on the display of the central unit. If a smoke detector is triggered, the user sees exactly in which the area the fire has started and can initiate the evacuation. To further support this, we have developed a radio alarm speaker which doesn’t just use loud sirens to warn people in the event of a fire. The new alarm loudspeaker uses plain language voice messages to instruct people on how they should behave in the event of an alarm and where they should evacuate to. This greatly helps the avoidance of panicking and the saving of lives. In addition, our smoke detectors are equipped with a heat sensor that triggers an alarm even when the temperature increases rapidly yet the fire is generating too little smoke to trigger a conventional smoke detector. In the event of an alarm, the central unit triggers not only an on-site an alarm but can also immediately alert the owners and fire department by e-mail, SMS and by telephone. And this new system costs 50% less than earlier fire detection systems. Production is already underway and the market launch will take place later this year. As promised, we have immediately started to update the design of the shop, this work will be concluded within the next 14 days. We are converting the current JTL3 system to the new JTL4 system. On the December 1st 2016, this year’s “Crowd Dialog” will take place. This is the leading practice and knowledge conference in Europe. We have been invited to this conference as speakers, in order to report first hand on our experiences concerning the topic of crowd funding. A small exhibition will also be held. We have been furnished with a stand so that we can announce Alarmtab to an international audience. The moderator of our contribution is Prof Dr Ralf Beck (Department of Economics, Dortmund Technical College). Our campaign will only be running for another 17 days, so use the opportunity now to invest in AMG Sicherheitstechnik, together we can achieve a great deal.